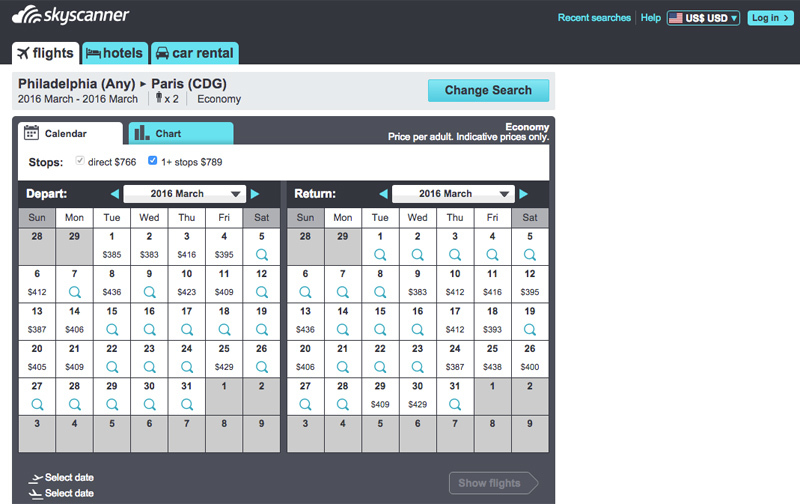 In this post I not-so-humbly bragged about finding (and immediately booking) a nonstop flight to Paris for $1 (plus an additional $640 in taxes). A few weeks before that, I booked a flight to Paris for a little over $700 total (nonstop on the way there, with a two hour layover at Heathrow on the way home). I thought I’d share my tips for finding good airfare deals, since I appear to be on a winning streak and a bunch of you expressed interest in how I snagged them. I wish there was some magical secret, or that airlines would lower their prices consistently with fuel prices, or at the very least that the basic economic principles of supply and demand didn’t really exist in this sector (there’s no reason the same flight to Paris in June should cost double what it does in March, just because more people want to go at that time of year, other than the fact that airlines are greedy mofos hellbent on making as large a profit as possible while screwing over the everyday passenger, and that is my manifesto against capitalism, the end.). But what my recent airfare scores come down to is persistence: a fair amount of website stalking, checking prices several times a day for weeks on end, and, unfortunately, luck. That $1 fare was gone an hour after I booked it, and if I hadn’t already gotten in the habit of checking frequently throughout the day, I would’ve missed it. A word of warning: If you want to go to the Maldives and you live in Idaho nowhere near an airport, odds are it’s going to be expensive no matter what you do, so these tips might not prove to be too helpful. Sorry, kiddos! I’ve tried to make these as universal as I could. 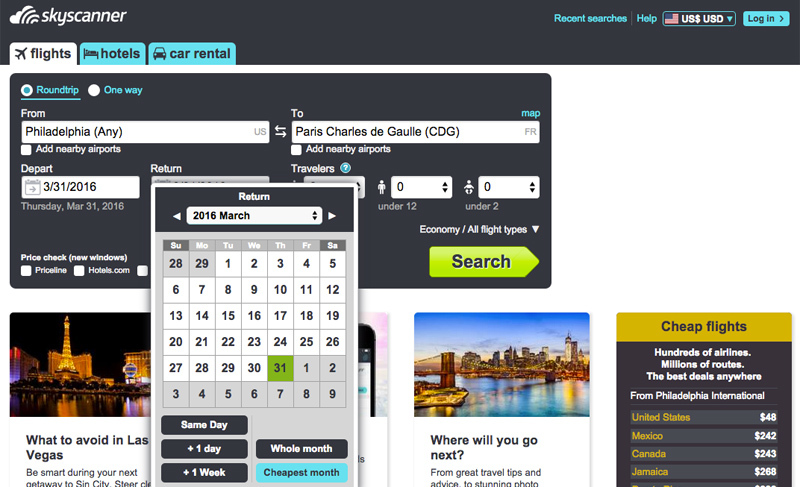 If you can be even more flexible than three days in either direction, sites like SkyScanner let you search across an entire month, including the cheapest month they can find. Sure, nonstop flights are the ideal. With as miserable as airlines and TSA regulations are making travel these days why prolong the suffering by switching planes, running through crowded terminals, and cutting into the time you have in your destination city? Because nonstop flights are expensive, that’s why. If you don’t mind having a short connection on the way (there or back), you’ll find that flights are generally cheaper (which is bizarrely counterintuitive, since it uses so much more fuel to take two planes, but I digress). Being flexible with the amount of time you’re comfortable traveling is a great way to score a cheaper flight. It was $150 less expensive for me to spend two hours in the London airport on the way home from Paris than it was to fly direct. I should note that I’m only flexible up to one layover. I love a good bargain as much as the next person, but I draw the line at having 2+ stops or a 33 hour layover somewhere just to save a little bit of money. 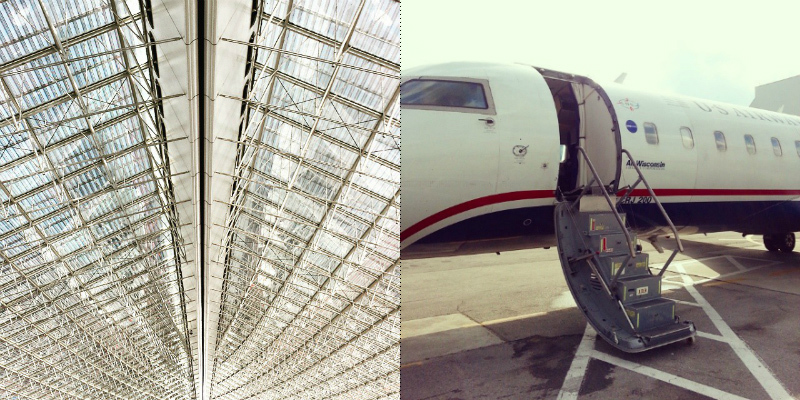 My sanity is more important, and I know if I traveled for an entire day and had to spend nine hours hoping to catch some sleep on the floor at the Frankfurt airport, I would be wiped by the time I arrived at my destination. (I also have the world’s worst luck when it comes to checked baggage, and have had airlines lose it for days at a time even on nonstop flights, so I don’t trust that I’d even arrive with anything to change into.) But that’s just me! Lots of people use long layovers to explore whichever city they’re in. Again, know what you’re comfortable with and how much time you’re willing to sacrifice. I was able to score my two most recent airfare deals more than likely because they both have me traveling during off-peak tourist season. Sure, Paris is rainy and gray in November, and colder in March than it is in May, but I’m more than willing to sacrifice a few blue skies if it means I can be there at all. We seem to equate “vacation season” as only lasting between April and September, but there are a ton of deals to be had if you’re willing to pack a few light layers and put up with a little bit of cold weather. I figure if the weather gets really unbearable in early December in Paris, I have more of an excuse to shop indoors, or linger at the Louvre, or read a book over a cup of tea somewhere warm. Being flexible with your vacation calendar can also mean there are fewer tourists going where you want to go, and you’ll enjoy the sights without the crowds. I’m lucky to live a quick cab ride to Philadelphia International, and lucky that Jamal’s parents live near Newark (I don’t know how people in the middle of the country do it). This gives me the option to look at more than one departure city. More flights to Europe fly out of Newark, because of its proximity to NYC, than Philadelphia, which means that those flights are typically cheaper (okay, supply and demand, I guess you’re ok sometimes). Jamal’s parents drove us to Newark when we flew to Brussels in 2012, but there is also a train from Philadelphia to Newark Airport that takes about an hour and costs around $60. So when I’m searching for flights, I know that flights out of Newark have to be at least the Cost-of-Train-Fare-Plus-Time less expensive too make it worthwhile. For my upcoming trip to Paris in November, there was a $650 flight out of Newark with an hour and a half layover in Reykjavík each way. Which was tempting, until I factored in the cost/time of either having Jamal drive me to Newark, taking a train myself, and worrying about the weather in Iceland in late November potentially delaying my connection flight, and realized I could spend another $50 and leave from Philadelphia. But the same is true with arrival airports, too. Don’t think there’s only one option! London has Heathrow and Gatwick, Paris has Charles De Gaulle and Orly, New York has JFK and LaGuardia, and the train between Barcelona and Madrid only takes two and a half hours. If you can save money by flying into one over the other, it’s easier than you think to still get where you’re trying to go. Most sites will give you the option to search nearby airports, but it helps to know they’re even an option. Know how much you’re willing to spend up front, before you even hit search. All the cheap flights in the world don’t matter if accommodations are going to cost an arm and a leg, or you have to kennel your dog at $500+ per week, or the exchange rate is unfavorable. Your budget for the trip doesn’t just include airfare. These tips can help you save on your flight, but only you know what constitutes as “cheap” relative to your budget. This isn’t sponsored in any way, but I prefer to use Kayak, which searches at least a few hundred different travel websites and aggregates that data for you. I’ve found they usually have cheaper prices than other sites (sometimes even prices that aren’t anywhere else) and I like their layout. Sometimes the cheapest ticket is through a site you’ve never heard of (JustFly.com, for example) and sometimes, like for my trip in March, it’s directly through the airline. That’s rare, oddly enough. A site I’d also recommend that I don’t think enough people know about is StudentUniverse.com. Like the name suggests, they offer cheap travel for students (up to age 26), and that’s where I found that $198 flight to London when I was in college. But they also offer adult fares, too, and while those are sometimes more expensive than the student fares, sometimes they’re exactly the same. Case in point: I booked my flight to Paris in November through them, on an American Airlines flight that was twice the price on the airline’s website, and more expensive on Kayak. 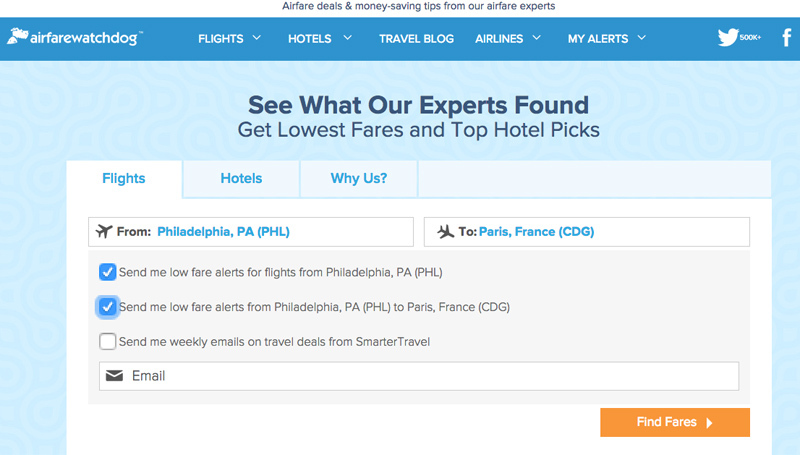 Almost every airfare booking site lets you create “price alerts” for your itinerary, which are emailed to you daily. Kayak and SkyScanner both offer them, and so does Airfare Watchdog, a site which doesn’t so much show you a list of available flight options, but rather finds the lowest fare it can based on a recently booked flight on the same itinerary, and tells you where to go to book it and what the travel requirements are, if any. Commit to checking websites every day, three times a day, breakfast, lunch, and dinner, for weeks. We’re all on our phones all the time anyway, so get in the habit of checking at least a few airfare sites instead of refreshing your Facebook feed. I considered it as much a part of my morning ritual as a pot of tea. It became almost a compulsion to keep checking throughout the day, to see if I could hit the jackpot (and it worked with both recent trips!). Checking constantly not only gives you a better chance at snagging a cheap ticket, it also helps inform you as to what price range your itinerary usually falls into (this goes hand-in-hand with #6). If you look at a flight every day for a week and it’s $1150 with a layover, you’ll have a better frame of reference to know you’re getting a good deal when, in week three of checking obsessively, the flight dips to $825 nonstop. I don’t put much stock into the rumors that it’s better to book flights on a Tuesday (something to do with airlines dropping prices after business travelers have booked their travel for the week) or that the best prices can be found exactly six weeks out, or even that you need to empty your cache between searches. What’s worked for me time and again has been persistence bordering on insane. So there you have it! 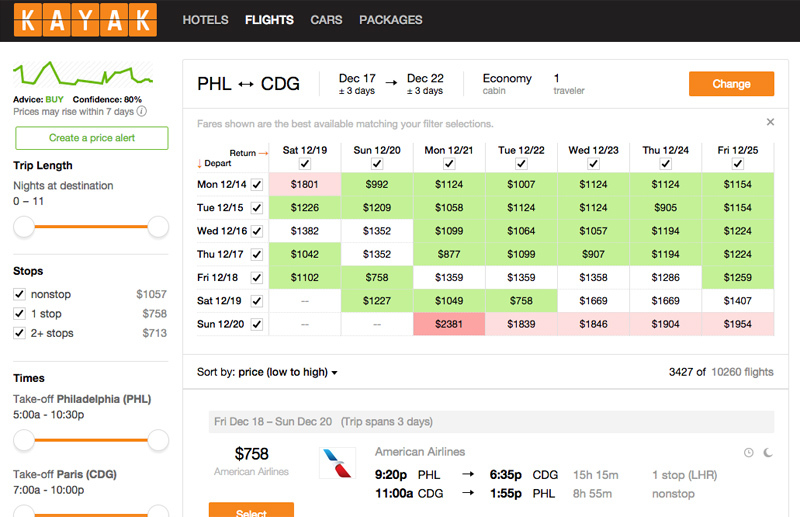 My ultimate (hopefully) helpful tips and hints to finding a good deal on airfare. If you have any questions or tips of you’re own, leave me a comment! I’m sure there are things I forgot to address. 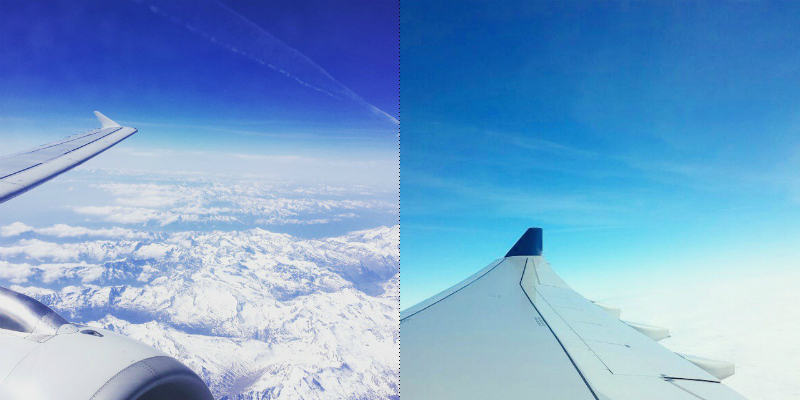 What’s the best airfare deal you’ve ever gotten? What a wonderful post, and quite handy too. Thanks for sharing and greetings! I’m feeling pretty smug about my upcoming Austin Chicago non-stop RT for $120, all in, but nothing really compares to a small city in Montana to Paris for ~$400 RT when I was in college. I was sitting next to a friend on the first leg, to Minneapolis, and mentioned my luck. She had paid more just to get to the Twin Cities. I miss Northwest’s killer fare sales. I’ve recently been using Hopper and have had great luck with them (and nope, not affiliated with them in any way). They take Kayak’s “Buy” percentage to a whole new data-science-y level. You can book through them for $5 (they save all of your traveler info, which can be applied in one click to flights, which I think is long overdue in terms of UX) or you can book with the airline/site directly. Thank you Erin for all of these tips. I just had a trip where the least expensive way to book was by using two different airlines each way. I had never done that or even considered doing that before, but I will be more ….flexible about this in the future. Yes! All of these things! Unfortunately, I’m not nearly as persistent as you or, dare I say, obsessive…. ;) even though I spend a good portion of my time on the internet. But perhaps I should be! I’ve only had one layover in my whole flight-life because I just prefer the convenience of non-stop flights, and because it just never seemed to work out in a worthwhile way. When my dad and I were searching for flights for my upcoming Madrid trip, we came across a few cheaper options if I flew to Lisbon and then took the train or had my parents come get me…. but then we never booked anything and just let the whole flight thing sit for a few weeks and when we looked (and finally booked) I was able to get a roundtrip to and from PHL/Madrid for $880! 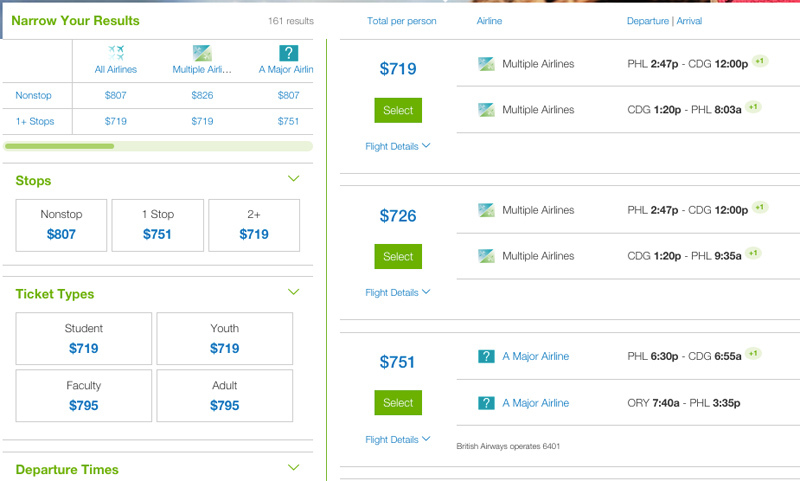 (Most of that being taxes and fees… with the actual tickets costing less than $200 each way.) I agree that $880 is still a hefty sum of money, but for a roundtrip ticket to Europe? A steal!